DUMBARTON were well beaten by Morton on a very cold and snowy day at Cappielow Park, Greenock, in front of a 1,450 crowd. DUMBARTON were well beaten by Morton in a Ladbrokes Championship clash on a very cold and snowy day at Cappielow Park, Greenock, in front of a 1,450 crowd. But it could all have been different had not the visitors lost striker Christian Nade after a horrendous foul 20 minutes, and then fellow striker Garry Fleming early in the second period. Jim Duffy’s men, who started the game three points ahead of Sons controlled most of the game, though the visitors challenged well in the first quarter and again in the final quarter. Sons were playing downhill in the first half and came close on several occasions through Garry Fleming and Grant Gallagher, but at the other end keeper Jamie Ewings was kept on his toes. Half-time arrived with no scoring. After the break a goal at either end seemed unlikely until home no.9 Denny Johnstone netted from close range in the 64th minute. Sons fought back, and Gallagher was thwarted a close range by keeper Andy McNeill before Joe McKee clinched the three points for Morton two minutes from time. 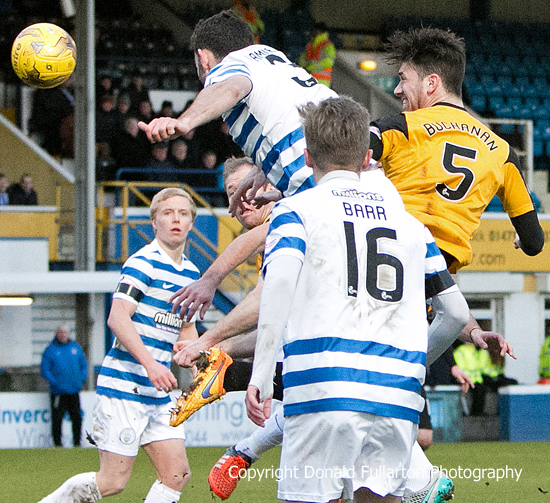 The picture shows Gregor Buchanan sending in a header.